If you came here, means that you are curious to know something more obout us. Ready to Start ? Welcome to Picnikphotoediting! a website that I have created due to my great passion for photo editing and Google’s Picnik photo retouching software. Photo retouching softwares, are, the perfect solution to edit photos, and save free space in your Hard Drive. 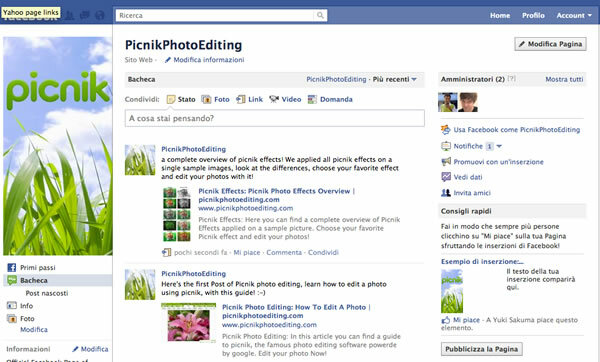 In this site you’ll find lists of photo editing software to download, online photo editing softwares, guides and overviews about picnik and the effects you can apply. We test every software before introduce it to you and we hope you’ll like our job and enthusiasm. Now, who’s writes on PicnikPhoto editing ? Who writes on Picnikphotoediting ? We are only in 2 people, that writes posts, and working on this site. Yuki and Ryuichi. Below you can read something about us. Hi! I’m Yuki and my job here is to write posts. I left the tedious works, like web design, etc, to Ryuichi. I work mainly to test the software we write about in the site, and than create posts and articles with lists of these tested softwares. Hi, I’m Ryuichi, my job here is to write posts, design and maintenance of this website. I write posts too, when, surfing to the web, I find interesting software to share with you. You can find us on Facebook too, don’t forget to “like” our page to be always updated! Picnik is an online software by Google, used to manipulate photos and for photo editing. In this website you will found many guides about Picnik, and you can also dowload the Browser version of Picnik, for Safari or Chrome. We also own a website, in italian, that is called Picnik Modifica Foto; that is the italian version of this website. Remember that Picnik will close in April, 19 2011, so you can continue to use Picnik's photo editing capabilities signing up to Google Plus, the new Social network by Google.